What Ever Happened to Tom Ogle and his incredible High Milage Carburetor? His super carburetor gave 100 mpg on a 427 inch v8 1970 Ford Galaxy and later: 200+ mpg. Did the world not go green because of a murder? Maybe 2 murders? The world is telling us to Go Green; from Sesame Street to the Campaign Trail, and Going Green has become as much a marketing tool as a call for action. But what most American’s don’t know is that these problems were solved thirty years ago by the brilliant invention of a Texas high school dropout. In 1978 I first interviewed Tom Ogle who created a device replacing the carburetor and allowed his 4,000 pound car to get 100 miles per gallon. He should have gone on to change history and become one of the world’s richest men. He was young, confident and feared nothing. But he was wrong – dead wrong. Four years later Tom, at age 24, was in his grave and his invention, buried. I stood outside the Smuggler’s Inn, a restaurant in El Paso, where I’d just interviewed Tom Ogle, only 21, and perhaps one of America’s greatest inventors. He was leaning against his 1970 Ford Galaxie. Fitted with a black box ‘filter’ the big gas guzzler was getting more than 100 miles per gallon. “Are you afraid of oil companies or the Arabs coming after you?” I asked. Tom said the 100 mpg returns he was seeing on his then standard 4,000 pound car was only the beginning of his newfound fuel efficiency. Tom felt confident that on the smaller, lighter cars, then only popular in Europe, he could get nine times as much. That means in today’s light-weight automobiles we could be driving around getting 400 to 900 miles per gallon. And even gas guzzling Hummers and giant SUV’s Tom never lived to see might be more efficient than today’s best hybrid cars. He did away with the carburetor and fuel pump; replacing them with a black box he called a ‘filter.’ The super mileage, he said, was due to his pressurized, vaporized fuel system that injected gasoline vapor, not liquid, directly into the engine’s firing chambers. The modified car was extensively tested and engineers found no evidence of fraud. In one test for the media Ogle drove his Galaxie, which unmodified got about 13 miles per gallon, 200 miles on a measured 2 gallons of gasoline. The results were so astonishing that the car was inspected for hidden fuel tanks. None were found and those who drove with him confirmed that they had never stopped to refuel. Doubters became believers. Scientists were convinced his invention, dubbed the ‘Oglemobile,’ would soon reach world markets and earn millions. Tom Ogle was checked out by corporate engineers and the US government who were astounded to discover the invention actually worked. At the time I had talked with the late Senator Gaylord Nelson (Dem. Wis.) a long time contact of mine and a pioneer for U.S. fuel economy standards, about what this could mean for all of us. “The potential benefits are too great for it to be ignored.” said the Senator and had asked the US Department of Transportation to make a thorough investigation of Ogle’s system but was met with a wait and see response from officials. Another big supporter of Ogle’s invention was Professor Gerald Hawkins of Texas A&M University, holder of a doctorate in mechanical engineering with a background in gas dynamics and aerospace study. “This is no hoax,” said Dr. Hawkins, “Ogle eliminated the carburetor and achieved what the gasoline internal combustion engine was supposed to do all along – to operate off fumes. For most of the world, the name Tom Ogle has never been heard or at least long forgotten. But, thirty years later can I still hear Tom’s voice from our recorded interviews promising the world better future. The engine got so hot Ogle used a fan to cool it and was amazed when it ran 96 hours on the fuel remaining in the mower’s small tank. He went from the lawn-mower to the automobile, converting a car in the same manner. Its engine started immediately, but the gas tank collapsed inwards. It took months of reinforcing gas tanks before he solved the vacuum problem. But the car, without its carburetor and fuel pump, still had no acceleration. It couldn’t run faster than 20 mph. And the modified engine averaged only 8 miles to the gallon, and stalled after a few miles. When he warmed the gas tank with heater coils, the miles per gallon sky-rocketed to over 100 and Tom Ogle never looked back. He believed his system was the answer to the world’s pollution problems and demonstrated virtually zero pollutant emissions coming from his engine exhaust. Soon Tom found himself courted by oil companies and financiers. Everyone predicted he would become a billionaire. A few months before I had met him he was contacted by C.F. Ramsey an ‘international financier’ who wanted to buy Tom’s patent and the marketing rights to the Oglemobile. But in every case the proposed backers wanted controlling interest in Tom’s patent. They wanted to stick Tom off in a laboratory. And that would have been the end of Tom Ogle and his fuel efficient system. And it was. That is exactly what happened. Ramsey signed a contract which let Ogle work on his device with financing from Ramsey who would take over the patent, distribution and development rights of the Oglemobile. With thousands flowing in, the confident Tom Ogle I had met was quickly building the life of luxury and extravagance. A few months after my first interview, his backer C.F. Ramsey sold out to Advance Fuel Systems Inc. in June of 1978. [a pre-planned hand-off] Tom was a bit nervous in my later phone calls, but all seemed to be well. He would continue receiving $5,000 a month and funds for research and development. He’d also get 6 percent royalties when the device came to market. 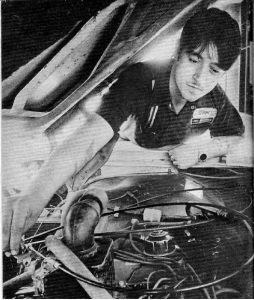 Advance Fuel’s own engineers would develop the ‘Oglemobile’ for marketing and in April 1979, a still very ambitious Tom Ogle opened the first of a planned 1,000 nation-wide diagnostic car centers. Continuing in his spiraling downfall from quick success and media attention in 1981, Monica, Tom’s wife left him and took along their five-year-old daughter Sherry. Then on April 14th he was shot in the street by someone who ‘got away’ yet he survived the incident. On August 18th a broken and forgotten Tom Ogle, drunk, left The Smuggler’s Inn, the same place that I’d first met him. That night he went to a friend’s apartment and collapsed. He was declared dead at El Paso’s Eastwood Hospital. His death, which involved a combination of Darvon, a prescribed pain killer, and alcohol, was ruled accidental or suicide. Many believed it was a cover-up for murder. In 1989 another American inventor, Stanley Allen Meyer, claimed to have invented a means by which a car could be fueled solely by water. He alleged that he had created a dune buggy which could travel across the United States on twenty-two gallons of water. He died in 1998 while celebrating the success of his invention with his brother and two financial backers from Belgium. Although his cause of death was stated as having been a brain aneurysm, many have speculated that he was poisoned so that the news of his invention would not spread and decrease the need for foreign oil. At the time of his death, Stanley Meyer had twenty patents on many water-fueled inventions. He insists there were no hidden fuel tanks or other alternate fuel sources used to power a two-ton automobile for 205 miles Saturday on only two gallons of gasoline fumes. Ogle isn’t alone, others verify his work. Carl Wright, for example, has been working on internal combustion machines for 35 years. He is a certified teacher of auto mechanics and is currently shop foreman at Peck’s Automotive Service, where Ogle built his controversial energy-saving fuel efficient system. “It’s no hoax.” Wright said in straight-forward fashion. “There were no hidden tanks.” Wright, who has no vested interests in the invention, said at first he was skeptical of the young man’s invention. Wright said any secret fuel compartments would have required many extra man-hours by Ogle to install in the car body. “He only worked on the car during office hours,” Wright said,”and he didn’t have a key to the door” to get into the automotive shop during off-hours or weekends. “He has not been here working on the car at nights, and the car has been locked up here every night.” Wright said. James Peck, who owns Peck’s Automotive, has a 50-50 partnership on any royalties from the invention. And he said he would stake his 30 year professional reputation in northeast EI Paso on the fact that there was no hoax involved in Saturday’s test drive. “I personally believe he (Ogle) had some help some-where along the way developing the system, although he will not admit to that. But I can vouch that the system works. It’s no hoax. It was my car he converted. We built system in my shop. I’ll put my name on the line. It definitely works. Peck said he provided financial back for Ogle’s invention after he and Ogle met about a month ago and discussed the system. Frank Haynes Jr. is registered state engineer with degrees from the University of Texas at Austin and Southern Methodist University. He was at Peck’s Automotive Saturday where he looked the system over and talked with Ogle. “From what I saw, there was no hoax.” Haynes said, adding that he learned of Ogle’s invention in The Times. ” I decided to venture out and see what was going on,” he said. ” I’d never even heard of Tom Ogle before. But I’m familiar with combustion from previous work and wondered what the kid had come up with. “What I saw was very convincing,” Haynes said. Haynes said he felt the only chance of a hoax might have been in the amount of fuel that actually was in the tank. Prior to the test drive Saturday, reporters and onlookers witnessed a mechanic at Peck’s empty the special, pressurized gas tanks, and pour two gallons of fuel into the tank after it was empty. Haynes said he was additionally convinced of the system’s authenticity by the fact it was difficult to start the car before heading to Deming. “The car had to be primed quite thoroughly in order to run. That gave me the idea that there weren’t any fumes in the system after drainage. “That was quite convincing for me personally. If there had been hidden fuel, there wouldn’t have been any difficulty in starting the car, according to how he (Ogle) described the system to me,” Haynes said. Ogle all along has maintained nothing but simple trust in his invention. Ogle added with a chuckle that the return to El Paso from Deming was made with one pint and two ounces of fuel left in the fuel tank. “We did pretty good though. We made 205 miles on less than two gallons,” he added. He said he maintained constant 55 to 60 mile per hour speeds. “Once I get to Deming and back I’ll have everybody banging at my door!” Tom Ogle exclaimed. It was as uncommon sentiment that may very well prove to be true. Saturday the 34-year-old inventor mechanic climbed behind the wheel of his 1979 1970 Ford Galaxy and headed down the road toward both the dusty New Mexico town and possible fame, fortune and a solution to the energy crisis. With only two gallons of gasoline in the tank, Ogle offered strong evidence that the tangle of red hoses and tubes racing between the back of the 5,000 pound car and the engine performed as billed: delivering over 100 miles to the gallon while averaging close to 60 miles per hour. Indeed, in a day of automotive and personal triumph, the only sour note was sounded when Ogle failed to bring his gas-saver back into El Paso as planned. On the outskirts of town, just a few miles from his final goal, a rock struck the underside of the car,puncturing a filter and allowing the gas fumes the auto travels to escape. But it really hardly mattered at that point. Ogle had traveled 205 miles on slightly less than two gallons of gas.Some of the precious liquid had been spilled when first poured in the tank. Actually, Saturday’s performance was rather modest. Ogle claims his system will average about 160 miles per gallon in city driving, treatment average of 12 miles per gallon. “I fixed-up my car, a 1972 Thunderbird with a 429 cubic inch engine, with the system,” Ogle said. “I then took it to Cloudcroft and back on two gallons, about 200 miles. The odd thing about Ogle’s system is that doesn’t add complex gadgets and intricate gimmicks. Instead, it removes the carburetor, a piece of the engine long considered sacred. “Engineers said it wouldn’t work because without a carburetor there’s nothing to vaporize the fuel,” Ogle explained during the trip across the hot dessert. “They couldn’t understand that it’s already working on vapors. Basically the system uses a standard engine with a few modifications In lieu of the carburetor there is a series of hoses feeding a mixture of gas vapors and air directly into the engine. Gas in the tank passes through a series of filters, which stretch the energy available in each gallon. The ??? also store excess vapors for later use for up to 45 days. Premium gas is needed, as its higher octane level allows for more vapors to build. Not only does Ogle’s car promise more miles per gallon, but he says it will clean the environment while causing its owner fewer repair headaches. “It will top anything on the road today, being smoother, better running and more efficient,” Ogle said. “The life of your car will be two times longer because there will be no carbon build-up. Before the journey began, two Times reporters looked the car over for possible hidden sources of fuel, and found none. Then a brief ceremony emptying the gas tank, and after the last drop fell, two gallons were poured back in. While only an expert could say for sure the trip was completed with only those two gallons, spectators, reporters and other interested inventors present all appeared satisfied. “This is the hottest thing of this century,” Frank Haynes, Jr. an independent engineer living in this area, said. “Engineers have been beating their heads against the wall to come up with something like this. El Paso, Texas — Is a young high school dropout the most important American inventor since Thomas Edison? Will he and the world energy shortage and show us how to drive from New York to Los Angeles on $15 worth of gasoline? Or is it all a hoax to get inventors’ money and infuriate the oil companies? El Paso has been excited ever since 25-year-old Tom Ogle, a simply-educated, home-town auto mechanic, astounded engineers by converting his car’s engine so it appears to drive 100 miles on a gallon of gasoline. Ogle did away with the carburetor and fuel pump, replacing them with a secret black box he calls a filter. The super mileage, he said, was due to his pressurized, vaporized fuel system that injects fumes directly into the engine’s firing chambers. Engineers have tried but found no evidence of fraud. On April 30 last year (1977) Ogle drove a 1970 Ford Galaxy 200 miles from El Paso to Deming, NM, on a measured two gallons of gasoline. The auto was inspected for hidden fuel tanks but none were found. Ogle and his car were under observation at all times yet the “Oglemobile” went the distance without stopping for fuel and averaged 100 miles per gallon at 55 mph. Doubters became believers. Scientists were amazed. Many were convinced Ogle’s claim is legitimate. Tom Ogle believes his new company, Ogle Fuel Systems, will soon become one of America’s largest corporations because the world must have his invention. He plans to have a miniaturized version installed in test cars by the end of July, and expects to have it on the market within a year, selling for about $300 a unit, installed. If he can survive criticism by giant auto and oil interests he could become one of the worlds richest men. And he will, according to millionaire C.F. Ramsey, an international financier from Longview, WA, who has backed Ogle with “unlimited funds” for world-wide marketing rights. Ogle was easier to meet with a few months ago but with success he’s become reclusive, a junior Howard Hughes hiding from the press. Then, he was set up in the back of garages owned by friends. Now, he is incommunicado, headquartered in El Paso’s most prestigious building and travelling in chauffeur-driven limousines and corporate jets. Before he went underground, Ogle told me, “We’ve had inquiries from Ford, Chevron, Shell, Volkswagen and Chrysler and calls from the biggest retailers in the world wanting marketing rights.” But company spokesman denied contact. Ogle said he refused one man,”Said he was the chief engineer for Shell oil and asked what I’d do if I got an offer of $25 million to sell out.” Shell denies it. But a spokesman for investor Ramsey, said many giant corporations had been in El Paso trying to buy up control of Ogle’s invention. The inventor said he discovered his fuel efficient system by accident, “I was messing around with a gasoline lawn mower when I accidentally knocked a hole in its fuel tank. I put a vacuum line running from the tank straight into the carburetor inlet. “The lawn mower kept running. “I just let it run and it kept running but the fuel stayed the same. I got excited. The lawn mower engine was running without a carburetor and getting tremendous efficiency.”The engine got hot so Ogle used an electric fan to cool it and was amazed when it ran 96 hours on the fuel remaining in the mower’s small tank. He went from the lawn mower to the automobile engine, converting a car in the same manner, its engine started immediately but the gas tank collapsed inward. Many months and reinforced gas tanks later, he solved the vacuum problem. But, the car without its carburetor and fuel pump, had no acceleration. It couldn’t run faster than 20 mph. And the modified engine averaged only eight miles to the gallon and stalled after 10 miles. When he solved the stalling problem by warming the gas tank with heater coils, the miles pre gallon skyrocketed to over 100. Tom Ogle hasn’t looked back since. He believes his system is the answer to the world’s pollution problems and has demonstrated virtually zero pollutant emissions coming from his engine exhaust at computerized auto engine test centers. In a typical test, with the engine running and the speedometer over 55 mph, a jet of clean hot air, without the usual obnoxious smell, leaves the Oglemobile’s exhaust pipe.”You can dry your hair with it,” said Tom Ogle. After an hours high-speed run, water in the radiator is only luke warm. And a spark plug installed before the test comes out cleaner than it had gone in. He isn’t afraid of oil interests.”My wife Monika is scared, afraid I’ll get kidnapped. But I’m safe. People still can’t believe or understand what I’ve discovered. Ogle said he asked President Carter’s assistance with developing his invention and had sent the president all the data and test results on his experimental model. At one point an official with the U.S. Energy Research and development Administration declared Ogle’s vaporized fuel system contained no fakery. “I think personally, and with strong conviction, that there is no hoax,” said Richard W. Hern, fuel engineer systems supervisor at ERDA’s research centers at Bartlesville, Okla. on May 6, 1977, after examining Ogle’s invention until his patent and other legal matters were settled. But later Hern said it was impossible to get such mileage as the invention promised. He couldn’t say more, he declared, because he was bound by a statement of confidentiality he signed so that he could view the invention. Ogle’s noisiest critic has been Robert Levy, an El Paso physicist who insisted it was impossible to move a 5,000 pound car more than 50 miles with the energy contained in one gallon of gasoline. Levy had stated the Oglemobile was a fraud but lately, as Ogle’s credibility grows, he has backed off, denying he ever called the system a hoax. Mack Massey, an El Paso auto dealer, who claims he’s an early Ogle backer, said a patent search made last year on Ogle’s system turned up a similar General Motors patent approved in 1972. But GM spokesmen said the company had more than 500 patents granted that year and would need a patent number to find out which invention Massey spoke of.Ogle said he received a phone call from GM requesting permission to inspect the car. But Joe Karshner, a company spokesmen, said “We haven’t approached Ogle. He has never made a submission to us and we’ve never gone to him. Another supporter is professor Gerald Hawkins of Texas A&M University, holder of a doctorate in mechanical engineering with a background in gas dynamics and aerospace study, member of the American Institute Of Aeronautics and Astronautics and The American Society of Mechanical Engineers. Another Texas inventor, Frank Read of Fort Worth, said he perfected a system to improve gas mileage and that fights with auto manufacturers almost broke him. He said he underwent 11 court battles with oil companies trying to buy of his unit with an agreement he never build another. He felt Ogle had a long, hard road ahead. In Washington a spokesmen for U.S. Sen. Gaylord Nelson (D.Wis.) said, “It sounds to good to be true.But if the Ogle invention proves feasible, results would be awesome. “America could become oil self-sufficient and the drain of oil dollars to the Middle East ended.” said Jeffrey Neddleman, legislative assistant to the lawmakers who pioneered U.S. government fuel economy standards.